Haircare is important to me, and I try to keep my hair in the best condition possible. I have blonde highlights so it’s important to use good products that treat my locks and keep them healthy! Luckily for me, I have a head full of hair. Some aren’t quite so lucky. But if you do find you’re starting to bald I was amazed to hear about the new treatment of Advanced Tricho Pigmentation – a type of tattoo procedure which mimics hair follicles so you’d never know the difference! Today I thought I’d share my current haircare routine. I switch up my haircare products a lot. I’ve recently been using the Percy and Reed Shampoo and Conditioner* a try after they kindly gifted it to me a few weeks ago. 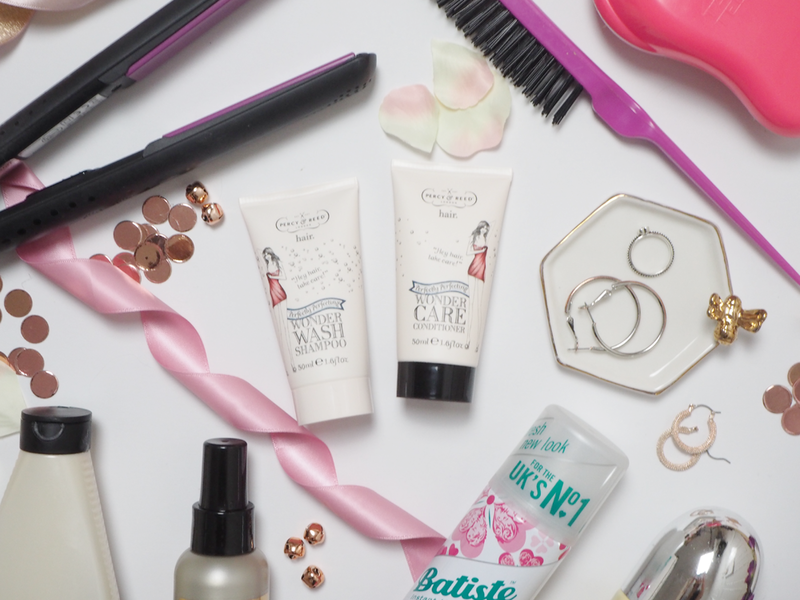 The Wonder range involve all kind of goodies to protect and care for my coloured hair and defends against UV too! When I’m not using Percy and Reed, I reach for my Redken Blonde Idol Shampoo. I love this shampoo, it smells just like what the salons use and helps keep me looking super blonde. For conditioner, I’ll tend to use Aussie conditioner – their volume one is my favourite. Following the wash, there are a few more products I’ll reach for to keep my locks looking their best! First up I’ll use Redken’s Frizz Dismiss – a leave-in serum which reduces any frizz in humidity! Finally, for that added extra shine I’ll use the Umberto Giannini Glossing Mist which smooths, defrizzes and leaves my hair looking glossy and healthy. I very rarely dry my hair with a hairdryer but prefer to leave it to air-dry naturally. My hair generally dries straight naturally anyway, but if I’m going out and want slick, straight hair I’ll use my trusty GHDs. 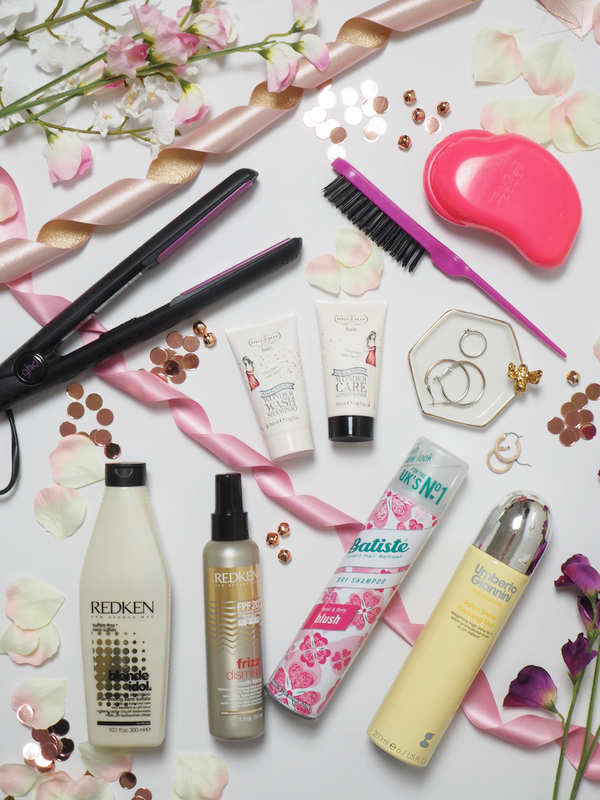 I’ve used GHD straighteners for as long as I remember and they’ve never let me down! Of course, I wouldn’t be without my Tangle Teezer to brush my hair, and I also like to use a backcomb brush when styling too – backcombing at my roots gives my hair that extra oomph and volume it needs! If you need some more tips on how to get voluminous locks, you can see my advice here. And there we have it! That’s how I look after my hair right now. What are your favourite haircare products?